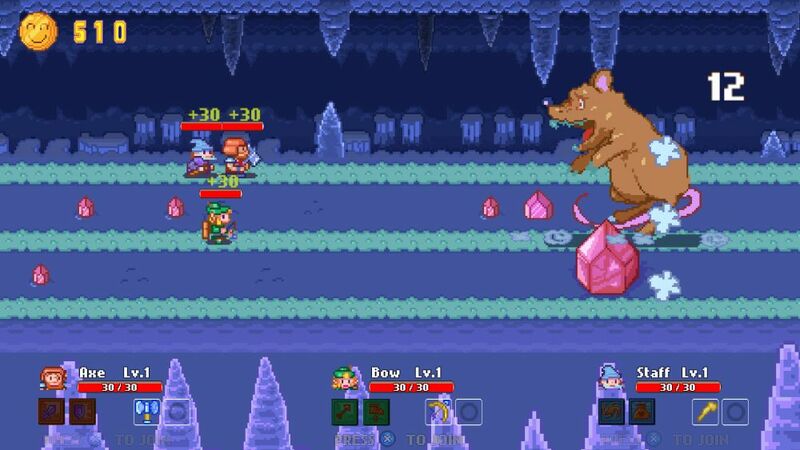 Axe, Bow & Staff has a straightforward name for a straightforward arcade RPG. Three characters, three weapons, three paths to take. 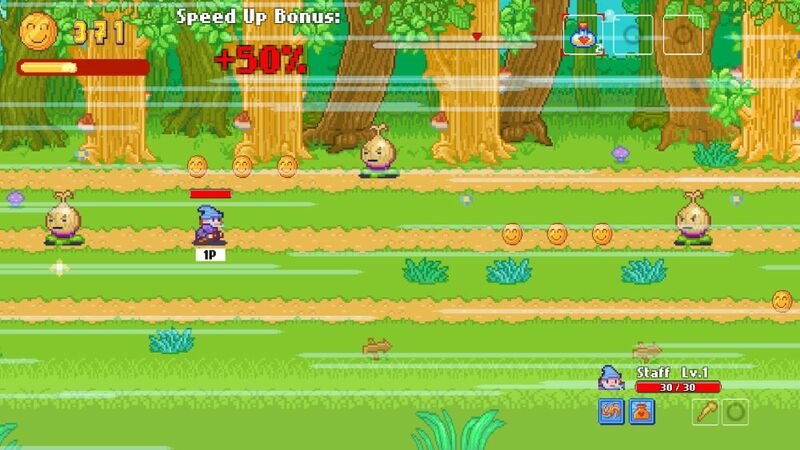 Hit stuff to stay alive and collect coins to buy new stuff. It couldn't get any more core than that. But best of all, Axe, Bow & Staff is the kind of game that comes to life once you get a good co-op party going. Hope you've got some friends! In Axe, Bow & Staff you control three characters: a warrior with an axe, an archer with a bow, and a wizard with a wizard stick (some people call it a "staff", but whatever). The party of heroes travels in a line across a series of auto-scrolling levels and must use their abilities to dispatch foes and avoid obstacles, else they'll find themselves on the receiving end of an embarrassing death. Seriously, when you die you fly off the screen and a comical cartoon wa-wa-wa-wa sound effect plays. It's glorious. Each character in Axe, Bow & Staff has their own skill to help the party survive. The warrior can swing his axe to take out adjacent enemies and will be your go-to guy for killing things that get in your way. The warrior also has a shield and is the only one who can destroy barrels. Stick him in the front and keep his health topped up and you'll do just fine. The archer has a snazzy long range attack along with a jump that lets him pass over obstacles to hit switches. 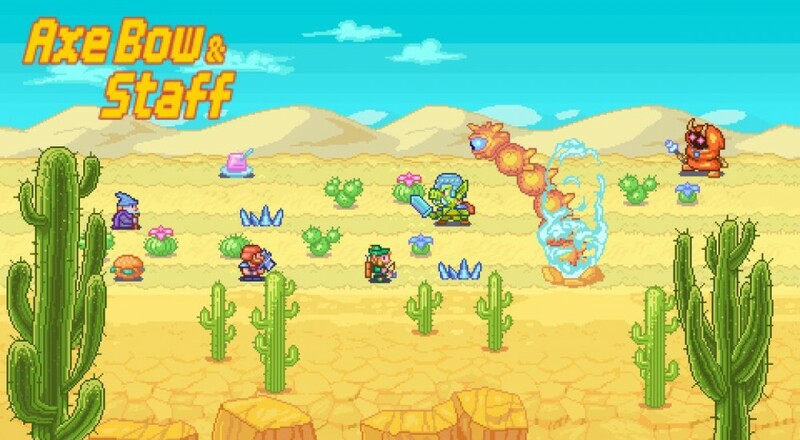 The wizard doesn't have a direct attack and instead spends his time sliding enemies up and down the screen, useful for moving them out of the way or placing them on a switch you need triggered. The world of Axe, Bow & Staff scrolls automatically, but you do have some room to move around. Levels have three paths stacked on top of each other, all you have to do is tap up or down to change between them in an instant. Use the layers to avoid enemies or nab stashes of coins, but don't get too crazy with all the swapping and hopping. One wrong move and you'll find yourself between a rock and the edge of the screen, and you know what that means, right? Wa-wa-wa-wa. After each level you'll take your loot and drop by the shop to purchase equipment. For the most part the available stock consists of beefy versions of your current gear, though there are some helpful items that let you squeeze some more entertainment out of the upcoming stages. Axe, Bow & Staff also features character upgrade trees you can spend points to burn through. Again, it's mostly about powered-up versions of your current skills, but later on you'll find new abilities that change the way you play the game. Axe throwing, yeah! Page created in 0.9554 seconds.